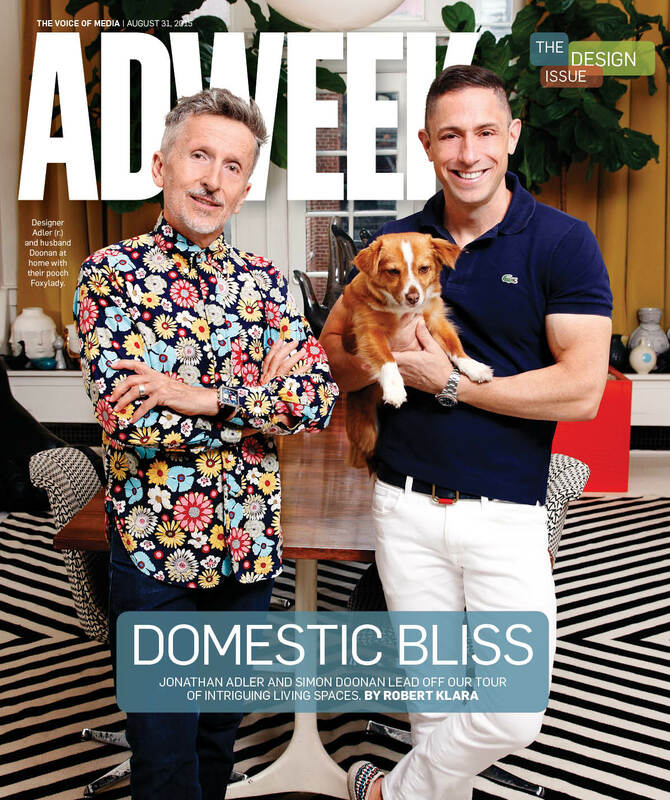 On a few weekends each year, an arts and crafts fair sets up shop along University Place, a narrow, leafy street in New York's Greenwich Village that borders the apartment building where designer Jonathan Adler and his husband, the designer and author Simon Doonan, live. Whenever Adler passes by all those struggling artists, he recalls a time when he was certain he'd be one of them. "I started out as a potter, as an outsider who never expected to make a living at all," he says. "I thought I was going to be hawking my wares at rain-soaked craft fairs. That's what I expected my life to be." bandages startles the couple's guests. Things, of course, worked out better than that. While he started out as a potter (and, in fact, remains one), Adler is now also the CEO of his eponymous, global design company, with 28 freestanding stores and range of accessories in a thousand chain retail locations. Adler's products run the gamut, from furniture to rugs, lighting and bedding. His aesthetic (shaped early on by his grandmother, who he calls "an Auntie Mame type") borrows liberally from every excess of mid-century Americana—a bit of Miami Beach and the 1964 World's Fair, a dash of Liberace—but makes it practical for everyday living. Adler calls it "Modern American Glamour." He also calls it home. Not content to confine his business affairs to his SoHo studio, he furnishes his and Doonan's duplex co-op with the furniture and accessories he sells. From a baby-blue Lampert tufted-velvet sofa ($3,595) to a brass Ulu side table ($1,350) to an Orange Pop decanter ($198), this is not only a showplace but a showcase for Adler's wares. "I make many thousands of products, and not only do I enjoy bringing them into my house, I just feel it's my responsibility to road test them,"
Adler says as he lounges in a riotously colorful space where tulip chairs meld with needlepoint toss pillows and Sputnik chandeliers. Adler refers to this carefree kind of accessorizing as "happy chic," and wishes more Americans would try it. "The sad thing is that most people don't feel like they have the leeway to play," he says. "Decorating seems intimidating to people and they feel like, 'Oh, if I'm going to live with something forever, I should choose something middle-of-the-road.' You should never settle for any object that is less than extraordinary because that's what will make your life and your home memorable." For years, it looked as though Adler's life was destined to be neither extraordinary nor memorable. A professor at the Rhode Island School of Design assured him he'd be a failure as a designer. After trying to break into the film business following college, he was fired from three jobs before returning to the one thing he was good at: making pottery. He'd loved clay since he was 13, having been introduced to it at summer camp. (He says the only reason he signed up for the class was because of a "super-cute" instructor.) But once Adler sat down at the wheel, he had a eureka moment. With 30 looming, he began to sell his work, sometimes at those rainy craft fairs. Then, in 1993, upscale retailer Barneys bought his first collection of pots. Five years later, Adler opened his first store. With the notable exception of items like sofas and sheet sets (Adler's bedding sells at JCPenney), most of Adler's objects still originate at the potter's wheel. Even many accessories that don't look like pottery—like the Giant Lucite Foot ($1,495)—began, in fact, as clay in his hands. "It makes sense that Jonathan's aesthetic is so close to what he originally did as a ceramist," says Architectural Digest editor in chief Margaret Russell, who appeared alongside Adler on the Bravo show Top Design and has featured his work in her pages. "I love the fact that someone told him, 'Don't do that—you can't make a living at ceramics.' And look: He's a home-furnishings mogul." While it might be tempting to slap a label like "retro" on Adler's work, Russell points out that his playfulness rests on a practical and sophisticated foundation. "There's an irreverence about the things he does, but he's far beyond retro," she says. "Retro is looking backward. Adler is very much looking forward. I walk into very chic Park Avenue apartments and there's a Jonathan Adler lamp and sofa." Perhaps the best measure of the practicality of Adler's work can be found in the 309 rooms of the Eau Palm Beach Resort & Spa, which Adler redesigned in 2014. "We wanted to define luxury on our terms," says the Eau's publicity director Nick Gold. "Jonathan took how South Florida looked in the 1960s, but with an updated approach. It's playful and modern and gorgeous." Adler's husband—famous in his own right, having spent 25 years as creative vp for Barneys—has contributed some of the more interesting items here, e.g., the knee-high crocodile boots from Yves Saint Laurent, the papier-mâché head of Prince. But he has largely left the decorating to Adler. "It's not really that I left it up to him—he just seized it," cracks Doonan with his characteristic English dryness. Having spent so many years creating Barneys' legendary windows (plus store displays, ads, and a lot more), not to mention authoring a number of books, Doonan, who remains Barneys creative ambassador at large, seems relieved to let Adler have free rein. "It's like living with a hairdresser—you get your hair done for free," Doonan says. "I come home and there's new couches. What's not to love?" Just don't get too used to the way the place looks in these pictures, Adler warns—he's likely to change up the whole thing by the time this piece comes out. "Auntie Mame's apartment was constantly changing and that's kind of how I roll," he says. "I'm wildly satisfied, but endlessly restless."